Close to town, yet completely away from it all. A homely, relaxed vibe, yet the care you receive makes you feel so welcome. The new pool is a winner, and gazing across the river is so relaxing, you will just want to stay put, and experience the area from your deck chair! A mere 3km from the popular seaside holiday destination of Stilbaai, the owner-run The Anchorage boasts a picturesque setting right on the Goukou River and is the perfect place to relax and unwind. Five bright and comfortable bedrooms will automatically give you that holiday feeling and since they’re equipped with everything you’ll need for a hassle-free self-catering stay, from DStv to fully kitted-out kitchenettes and king-size or twin beds, it’ll feel like your home away from home. 4 of the 5 rooms has either a balcony or veranda offering lovely views across the river, as well as a Weber braai – perfect for outdoor entertaining and meals, particularly in the summer. A spacious outside area with a swimming pool invites you to cool off and relax with a book or magazine from the library, while the guest lounge with its open fireplace and flat-screen TV is the ideal place to kick back at the end of the day. Days can be spent swimming in the river, fishing, canoeing, golfing on the 9-hole course or enjoying scenic walks. The area simply lends itself to lazy afternoons, fun activities and exploring. Enjoy the beaches of Stilbaai, as well as whale-watching in season, bird watching, surfing and diving. With its laid-back feel and natural beauty, it’s really easy to let go and relax at The Anchorage. "My wife and I chose The Anchorage as a half way stop between Knysna and Cape Town and were very pleased that we did. 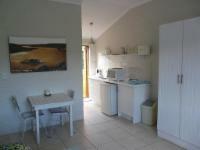 The rooms are very well presented and have everything one might need for self-catering. The bathrooms are very modern and clean and have both bath and shower. Sitting on the veranda at sunset, overlooking the river, was a very relaxing way to end the day. Our hosts were very friendly and helpful. Breakfast was wonderful and a nearby restaurant was handy for evening meals. It would have been nice to have stayed longer." "The Anchorage was a really wonderful little gem in Stilbaai. Wonderful setting, fantastic hosts and superb rooms. Everything was spotlessly clean and nothing was too much trouble for Annette and Craig. Will definitely be back next January." A private path leads you to the Anchorage, pass the horses and horse stables to your right and the river to your left. For your check-in and during your stay please park your car between the garage and the grape wines. S34° 20' 54.83" E21° 24' 37.19"